With a new location in the New York Catskills, Happy Paws K-9 Academy offers a unique approach to dog training that helps dog owners get the results they want not only by training the dog, but by understanding their dog's behavior and modifying their own behavior to enhance the communication and bond between human and canine. The answer to all your canine problems! Happy Paws K-9 Academy announces a new location in the Hunter/Windham ski areas of upstate NY - A unique way to communicate with your dog. Happy Paws K-9 Academy, known for its unique communication-oriented approach to dog training, (http://www.happypawsk9academy.com) has opened a new location in the Catskills in Maplecrest, New York (the Hunter/Windham ski area). Their philosophy is that training a dog is not just about the dog. Rather, in their approach to good canine behavior, they not only teach the dog what is acceptable and not acceptable behavior, but they also teach the humans how their dog perceives what they are saying or doing. They will show you how to modify your behavior to get the results you desire. According to Head Trainer Lorraine Siena Reid (http://www.happypawsk9academy.com/AboutUs.aspx ), there are many things that affect your dog’s perception such as your body posture, timing, the tone of your voice, and your attitude – just to name a few. For that reason, Siena Reid uses lots of affection and praise in her training techniques. But unlike most dog training firms, Happy Paws K-9 Academy does not believe one method of training fits all. Rather, they use a combination of methods that best fit the needs of your dog. Does your dog just need some house manners or has that lovable four-legged pooch traded his halo for horns? Has that cuddly lovable animal you first brought home turned into Cujo overnight? Have you been asked to leave other obedience classes? Have other trainers told you your dog is hopeless and should be put down? 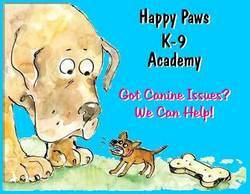 Happy Paws K-9 Academy has had successful results with a vast array of dog problems. “The more issues we can help you combat, the better it looks for us,” adds Siena Reid. Happy Paws K-9 Academy offers a free private in-home consultation to discuss the needs of your dog – and they do not believe in high-pressure sales tactics. “The only thing you’ve got to lose is your dog’s bad behavior,” says Siena Reid. Lorraine Siena Reid is also available to speak with the media about a variety of dog training methodologies and behavior questions. For more information visit http://www.happypawsk9academy.com, e-mail info(at)happypawsk9academy(dot)com or call (516) 483-0579 (weekdays) or (518) 734-5435 (weekends).